Excellent trek, which takes you from semi-tropical forests to Alpine pastures, including visit to interesting villages and the Gasa Dzong. The superb view of Masang Gang (7,194m) can be seen from here. Also this trek trek offers a good opportunity to see blue sheep. In case if you are luck, you ,may also see ‘Takin’ and Bhutans’ national flower, the Blue Poppy. Good time to undertake this trek is during April. -Drive to Drugyel Dzong (a ruined fortress - 16 kms, away from Paro Town) or the fortress of the victorious Drukpas. From here, the peak of Chomolhari "Mountain of the Goddess" can be seen on a clear day (Alt. 7,329 mtrs/ 24,029 ft.) On the way back, visit a typical Bhutanese farmhouse. -Visit the Rinpung Dzong. Built in 1645 A.D. this fortress is presently the seat of the district administration and the residence of the monk body. -Visit the National Museum (Ta-Dzong). Once the watchtower for the Rinpung Dzong, it was converted into the National Museum in 1968. -Visit Kyichu Lhakhang ( Lhakhang means Monastery ). Kyichu Lhakhang was built in 659 AD by the King Songtsen Gampo of Tibet as one of 108 such monasteries built across the Himalayas to spread Buddhism. It is located between Paro Town and Drugyal Dzong. This temple marks the advent of Buddhism in Bhutan. -Drive to Drugyel Dzong (2,580 m) from where our trek begins. The trail follows the river gently uphill through narrowing valley and agricultural fields. The night's camp is just beyond an army outpost. -Though this is not a long day trek but it is a bit stressful trail as one needs to do bit of climbing. Today the trail goes up beyond the camp, then will pass through an army camp at 3,730 m – then the trail crosses a wooden bridge over a fast flowing stream a short distance beyond the army post. A short climb leads to a small chorten on a ridge. The valley begins to widen again. All around high mountain ridges and snow-capped peaks come into view. Yaks and yak herders' winter homes become a regular feature of the landscape. The night camp is beneath a ruined fortress at the base of Mt. Chomolhari. -Trek up to Tsophu or hike around the area. There are good short hiking trails in three directions. Chomolhari and it subsidiary mountain chains lay directly West, Jitchu Drake to the North and a number of un scaled peaks to the East. -Trek through wide yak pastures and up and down passes. As you come down into the Lingshi basin, you get a wonderful view of Lingshi Dzong on a clear day. Tsarim Kang and its glaciers rise up at the north end of the valley. Night halt is a choice between a stone hut or the tent. -Continue trek by crossing a stream below the camp then we climb up the opposite side to a chorten just below Lingzhi Dzong. On the way we will visit Lingzhi Dzong and as well as Lingzhi village. The trail then passes through the lower section where there are not much of houses. We will pay a visit to Lingzhi village then continue walking along a hillside. After an hour the trail goes towards a pleasant settlement of Goyak 3,870 m – from here then the trail descents into a spectacular Chebisa Valley. -Climb the ridge behind Chebisa, passing through few houses and then we will take a long, steep climb to Gobu-la (pass) 4,350 m. On the way, we will come across yak herders huts but otherwise the valley is uninhabited. Then we will follow a larger trail which contours up the side of the valley and then drop down a side trail to Shomuthang. The trail goes up the valley through uninhabited village up to Jhari La 4,747 m - in the north you can see a big snowy peak of Gangchhenta (6,840 m) also you can see the top of Jhomolhari if the weather is good. Then the trail passes through rhododendron forest on the stream’s left to Tsarijathang Valley which has been declared as a special Takin Sanctuary. Then the trail goes up steeply on the northern side to a crest and then traverses to a side valley. -Climbing up to Shingela pass, alt. 5005 mtrs., this is long and hard one. The snow covered peak of Gangchhenta fills the horizon to the north. Then we will go down on a rough, rocky trail that follows a moraine into Kango Chhu. From here we continue a yak pasture then through cedar forest to Lemithang. 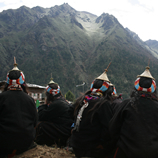 Lemithang is under the Laya District and you will see people dressed in typical Laya costume with conical bamboo hats. Camp at Lemithang. You will be able to see Gangchhenta peak towering over the campsite. -Walking through deep cedar forest, crossing many little, muddy side streams. Then ou trail goes down steeply to side of the river, we then cross the river right on a wooden cantilever bridge then again make stiff climb up. Then it is a long walk through the heavily wooden, uninhabited valley. Peak Gangchhenta dominates the skyline to the west of the village, also you might have a glimpse of 7,165 m peak Masang Gang. -A rest at Laya but we can use the day exploring the Laya Village. -Big ascent to cross the Bare La pass, Alt. 3,900 mtrs., after which the trail goes all the way downhill through bamboo forest to the camp site which is close to Gasa Dzong. -Trek to Gasa Tsachu. After lunch relax in the hot spring. The Gasa Tsachu is one of the most popular hot springs in Bhutan. -A short climb, the trail winds through the rolling hills and passes through the pine and oak forests, villages and wheat fields. You will also see a beautiful view of the Gasa Dzong glued to the valley wall, seeming to float in space. -High agricultural benches above the Mochu (Chu means River ) into a lush semi-tropical gorge filled with banana trees, creepers and various tropical vegetation. You will also see monkeys and few other animals occasionally. Vehicle will pick up and drive to Punakha. -Visit the Memorial Chorten a huge stupa built in memory of the third king of Bhutan who reigned from 1952-1972. Visit the National Library where ancient manuscripts are preserved. Visit the Wood Craft and Painting school where traditional arts and crafts are still kept alive. Visit the Handicrafts Emporium where Bhutanese textiles and other arts and crafts are displayed and can be purchased. Visit Simtokha Dzong. This is one of the oldest fortresses in Bhutan. It was built in 1629 A.D. and presently houses the largest monastic school in the country. Visit Tashichho Dzong, the seat of the Royal Government as well as the summer residence of the Head Abbot and the central monastic school. -Drive up to Satsam Chorten (10 klms from Paro town) and from there walk up to Taktsang Monastery. The name Taktsang means " Tiger's Nest ". The Monastery is perched on a rocky ledge with a sheer drop of nearly 4000 ft. and offers an excellent view of Paro valley. It is said that in the second half of the 8 th century, Guru Padma Sambhava meditated in the spot where the Monastery is situated, having alighted there on the back of a flying tigress. Picnic lunch at the Taktsang cafeteria. The round trip hike takes about 4 hrs.